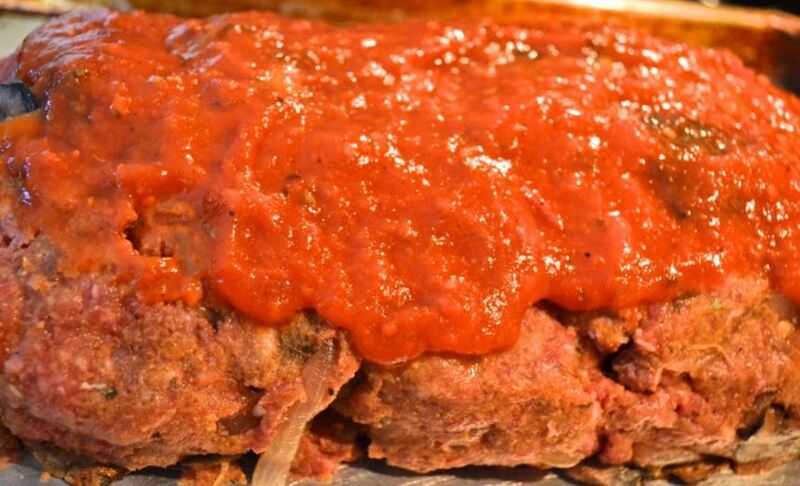 This meatloaf is very hearty and gives a huge portion. I am not much of a mushroom fan, but they sure taste good in this recipe! Preheat oven to 375 and spray a baking dish with cooking spray. Meanwhile, heat 1 tsp. oil in a large skillet coated with cooking spray. Add the onions, garlic and sugar; cook until golden ( about 10 minutes). Remove onions from skillet. Heat remaining teaspoon of oil and cook mushrooms until tender. Place mushrooms and onions in a large bowl. Add ground beef, bread crumbs, egg whites, basil, salt, pepper and ½ c. tomato sauce. Mix by hand and form into a loaf. Place in baking dish. Top with remaining ½c. tomato sauce. Bake 45 minutes to 1 hour or until desired doneness.